I have a thing with street food, maybe its because in all the food shows I watch it always looks like the best parts of cuisine all over the world. I have tried a good amount of street food, from Mexican street tacos to Thai street food- all of it delicious. Now, adding more to my street food repertoire is Egyptian Street food. Now, I have had Egyptian food before, actually quite often because my dearest friend is Egyptian plus she is an amazing cook so I have had some pretty stellar food but now introducing street food to that? Life made. Koshari. One word, one word that transforms your palette and keeps you guessing what’s around the next corner every time you take a book. I introduce you to Egyptian Street food, a “one bowl meal” if you will, where everything is put together in layers and then topped with delicious sauces that meld together to create such a complexity in flavor you keep begging for more. I can now say I have tried this delicacy in my own backyard. Introducing Koshari Mama, a local small business that has opened the world of Koshari to me and many others in the area. Run by a mother-daughter duo, Sahar and Dina, these powerhouse women know what it means to make and serve good food. When I met them for the first time, before I had even tried the Koshari I was immediately taken by both of them. Incredibly kind women with a sense of community and dedication, something that these days can seem hard to find. Then when I tried the Koshari for the first time I finally understood the hype, IT IS GOOD! 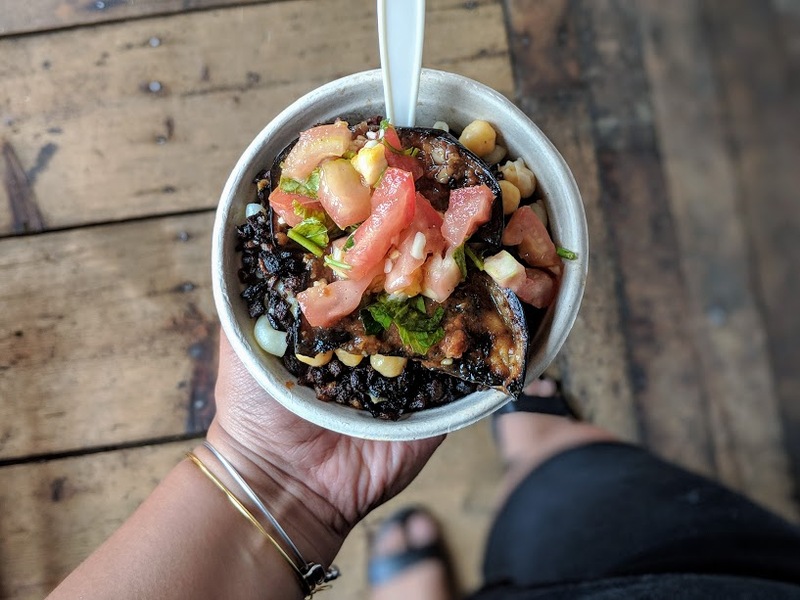 I had the chance to ask them some questions so I hope you will enjoy the QA and take a look at the photos I have shared of this amazing dish plus the fresh, local ingredients Koshari Mama use along with where their pop up locations are. Q: Why did you start Koshari Mama? A: We offer Egyptian vegan street food that is delicious and uses fresh, local ingredients whenever we can. We hope to get into the Boston Public Market as an initial step and then open a storefront once the right opportunity comes along. We want to continue connecting with people through food and expanding our menu to give people a little taste of Egypt’s vibrant street food culture. Q: What inspires you to cook and share the dish with others? A: The inspiration for cooking for us is tradition. Dina, my daughter is a trained chef. She worked in the food industry for 12 years and she learned a lot. However, she wanted more from the food world. We both knew that food is a connector and can have an impact on people. So, we shared a bit of our tradition. My mom was an immigrant who missed her country and brought back a bit of “home” by recreating some of her favorite food. One of those was koshari. I remember this as a child and remember all the tastes and sounds and it is a special feeling. This I share with my daughter and my family and this is what we want to share with others. We are inviting people to share with us a part of our tradition. Q: What do you want people to feel when they first take a bite of koshari? A: People always are amazed that this strange combination of food can taste so good! So, we love the first response to be wow! This is delicious and we want more! Tell me more. Q: What are some of your favorite memories of cooking? A: My favorite memories of cooking are from my mom, Dina’s grandma. She was a great cook who loved to cook with people and share with people. My sisters and I were always part of the process of cooking. She made cooking special. This love of cooking continued in our family and continues until today. Cooking is so important to us. It’s not about just eating, it’s about sharing. Q: Where can my followers find Koshari Mama? Q: What are the ingredients in Koshari (your Koshari) and what else do you offer? A: Koshari Mama’s koshari is made up of lentils, rice, chickpeas, pasta and fried onions. Then you can pick your sauce. We have a garlic sauce and tomato-based sauces that vary in heat. Currently, we also offer baked eggplant with tomato and garlic and various types of fermented vegetables. We also have seasonal dishes and sides. For example, right now, it is our tomato and garlic salad topping. We also serve balady bread which Egyptian country bread that is made for Koshari Mama by Chef Sawsan Galal at the Sally Webster Inn in Rockport. We will continue to expand our menu and add seasonal specialties…..stay tuned! Sahar loves food and loves to travel so she could learn more and more about other cultures. She loves animals and has too many at home but she doesn’t care. her family is the most important thing in the world to her. She comes up with all these ideas at strange hours of the night and actually gets up to make a note of it so she doesn’t forget and….she is definitely a dreamer, something that she feels is really important. Dina loves food too! She loves the idea of changing the world with food. She is extremely organized and actually enjoys organization of all things. She actually thinks of creative ways to organize and make the most of small spaces. She is a traveler, not afraid to experiment with food and has a ridiculous sense of humor. A beautiful and flavorful dish! I enjoyed every single bite of this delicious dish and I hope you will seek out Koshari Mama to try it as well. Stay tuned for more collaborations between us and have a stellar weekend everybody! September 15, 2018 September 16, 2018 by Timna N. Right?! It literally made me so happy to eat this. Everything looks so good! I would love to try out Egyptian cuisine as I really enjoy trying foods from different cultures!! Same here. Thanks so much for stopping by. I would definitely love to try this!! yum! So tasty! Thanks for stopping by! Looks absolutely divine! I’ve never had Egyptian food but now I’m eager to try. Thanks for sharing! Absolutely! Yes it is incredibly addicting! Yum! this looks soo good!